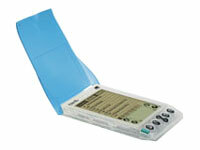 The color pack for Palm III organizers contains 3 flip covers and 3 styli. Just clip one of the covers on your handheld to give it a little chromatic panache. Add the complementary stylus, or mix and match colors. The styli are the same high-quality instruments that come with the organizers. Colors: blue, lime, aqua.